Before I start today’s posting. I would like to have a few words with my viewers. While I am glad to note that some of those who have signed up for viewing this blog reside in Germany, UK, Thailand, Singapore, Dubai, New Delhi, Bangalore and Chennai, besides all my relatives, I regret that except my relatives, other viewers have not come forward to comment and I would be pleased to hear from them too! Normally whatever measurements I have given here are approximate equivalent of ingredients I use on eye ball measure as such I am very much interested to have the feed back of those who tried any of the recipes as to whether they could prepare the item well and whether it was tasty, whether the measurements were right or any adjustments were made to rectify the taste etc. Am I asking too much? 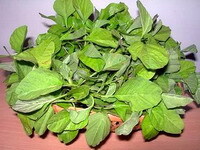 This type of greens has conical shape leaves and is available plenty in Tamil Nadu (See the image). Wash it well remove the mud and other impurities. Cut the roots and take the leaves with green stem. Chop finely and either grind them raw and boil or boil them with a little water and then grind in the mixie with just one revolution so as not to make it fine paste but a bit coarse one, reasonably a homogenous mixture. Mix with this salt, sugar and rice flour dissolved in a little water well and again boil it for another 5 to 10 minutes. Remove from the fire. Now, just place over its surface the cumin seeds and asafoetida. Heat oil in a kaDAi and add mustard and red chillies to splutter. Then pour the hot seasoning over the cumin seeds and asafoetida. KIrai masiyal is ready. 1. Since the greens should not lose their natural colour, boil it with a little water only adding sugar just to drive off the raw smell. Pressure cook the small karuNaikkizhangu with the skin after washing or if you use ChEnaikkizhangu (Yam) then you have to peel the skin, cut into big pieces and the cook. In the case of small karuNaikkizhangu, remove the skin after cooking. Keep aside. 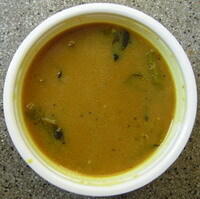 Take oil in a kaDAi and season mustard, black gram dAl, curry leaves, ginger and green chilli cut into small pieces. After these splutter add a cup of water and add turmeric powder, salt and asafoetida. Add also the karuNaikkizhangu or ChEnaikkizhangu after mashing into small pieces. Allow boiling for 5 minutes and if it is very thick you may add a little more water to make it gravy. Remove from fire and add the juice from the lemon after removing the seeds. Mix well. If the lemon is too sour, then do not use the entire half portion but add only a few drops. If you want it to be more sour, then squeeze the entire half lemon. 1. To have a different taste, some people add ½ cup of curd (normal sour) in place of lemon juice. If the curd is too sour then add just 2 or 3 tbs. A few use tamarinds extract in place of lemon or curd after extracting juice from a small gooseberry (NellikkAi) size tamarind and add it in place of water for boiling. 2. My mother prepares masiyal from ribbed gourd (PIrkangkAi) also. Here after peeling its skin, she cuts it into small dices. 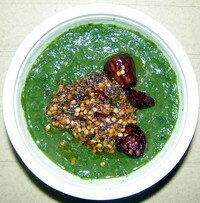 She also pressure cooks ¼ cup of split gram dAl. Then she sautés a little mustard, fenugreek, black gram dAl, 1 crushed red chilli and ½ green chilli over oil and adds turmeric powder. Now she adds a little water and the cut ribbed gourd pieces. After the pieces boil well, she adds the tamarind juice extracted as above along with ¼ tsp turmeric powder salt to taste, ¼ tsp asafoetida, ½ tsp sugar and the cooked dAl. After allowing boiling for 5 minutes, the masiyal is removed from fire. It is garnished with curry leaves. For this masiyal, do not add more tamarind water as the sour taste will spoil it. It should be just a little sour in taste. Masiyals are the best side dish for any type of vatral kuzhambu or thuvaiyal rice. 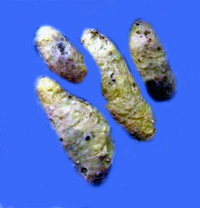 Some use them as side dish for poDi rice too. It is better to remove all the plates and dishes used by your guests immediately after they wash their hands since it will not look nice talking to them keeping these in front of them! When you return any container brought from or sent by your friends or neighbour, wash and wipe them clean before returning and preferably filling them with some edibles instead of returning empty!! It is a good practice to return others’ properties at the earliest. 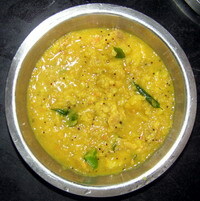 This entry was posted on March 23, 2011 at 8:15 pm and is filed under Masiyal Varieties with tags asafoetida, black gram dAl, chenaikkizhangu, cumin seeds, karunaikkizhangu, keerai, Masiyal, mulaikkeerai, mustard, peerkangkaay, red chilli, refined oil, rice flour, salt, sugar. You can follow any responses to this entry through the RSS 2.0 feed. Both comments and pings are currently closed.